﻿Proud to be a Home Baker operating under the﻿ Texas Cottage Food Law! 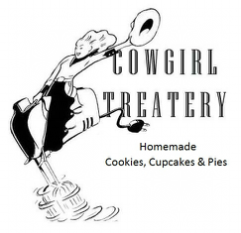 Cowgirl Treatery is locally owned and operated in Austin, Texas. I am a home baker who personally designs, bakes and decorates sugar cookies, cupcakes and pies to order. Cowgirl Treatery's home baked goodies can be ordered to your specifications. I offer decorated sugar cookies and cupcakes by the dozen only (two dozen minimum) and whole pies. Prices range from $18 to $60 per dozen, depending on size and complexity of design. Cookies and cupcakes can be packaged individually for an additional charge. I have been baking since I was 6 years old, when my mother tricked me into moving from my Easy Bake Oven to "the big girl oven." At 7, I began a life-long obsessive search for the perfect, flaky pie crust.